The final day of the ‘advent calendar’ focusing on some of the historical/genealogical sources that I used in the writing of Barefoot on the Cobbles. Several of the characters in the novel experience periods of mental ill-health and some of them spent time in the county asylum. I went to the Heritage Centre in Exeter where the admissions’ registers are held. The amount of information that is given varies with date but I was able to view details of my characters’ diagnoses, home life, treatment and progress whilst they were in the asylum. There were lengthy accounts of their behaviour and the symptoms that had led to their commital. Many of the personal records also give detailed physical descriptions. No photographs of Aunt Matilda survive. Everything that the reader learns of her appearance is based on what I could glean from her asylum register entry. Although I didn’t use this for the novel, an excellent website on the history of mental health is the Museum of the Mind, which focuses on Bethlem Hospital. These records are both fascinating and tragic; they are high up on my list of favourite sources. More information about Barefoot on the Cobbles can be found here. Copies are available at various events and at all my presentations. You can order from Blue Poppy Publishing or directly from me. Kindle editions are available for those in the UK, USA, Australasia and Canada. Now for the second offering from Sara Read, this one co-authored by Jennifer Evans. 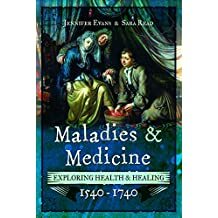 I would like to introduce you to Maladies and Medicine: exploring health and healing 1540-1740. After an introduction that explains the theories underpinning medical practices at the time, the book is arranged on an ailment by ailment basis. The authors look in turn at head complaints, abdominal maladies, whole body ailments and reproductive maladies. Each condition is discussed in terms of ‘causes’, as understood at the time, preventatives and ‘cures’. The authors have used a wide range of contemporary sources, medical treatises, letters, herbals, diaries and case notes, to help the reader understand attitudes to and treatments of, diseases and conditions in the early modern era. The book is enhanced by black and white illustrations and a bibliography of written and online sources. This is another book that is comprehensible to the interested amateur, whilst being underpinned by serious academic research. The writing style is accessible and amusing at times, although perhaps not for the fainthearted, as historical medical treatments were not pretty. This book had obviously appeal to me in my Mistress Agnes mode and I particularly enjoyed writing the health and medicine chapters in my own Coffers, Clysters, Comfrey and Coifs and Remember Then. The former even has a medical procedure on the cover! When Maladies and Medicine hit the shelves earlier this year, I had no hesitation in adding it to the reading lists for the students on my online In Sickness and in Death – researching the ill-health and death of your ancestors course. It only doesn’t feature in Til Death us do Part: causes of death 1300-1948 (or for ebook fans) because I wrote it before Maladies and Medicine was published. And in ordinary life, what ever that is, the great cover debate for Barefoot on the Cobbles continues. It now looks very different from yesterday’s version. Amidst addressing Christmas cards and anguishing over cover designs, I have been writing the Barefoot inquest scene and wishing there were forty eight hours in a day.